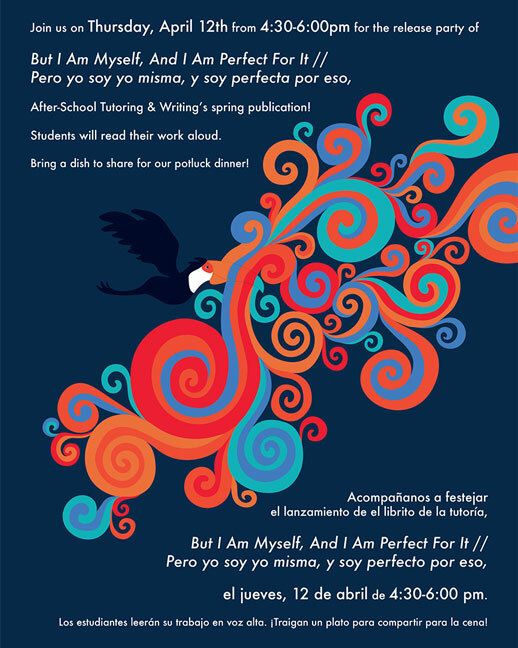 Join us on Thursday, April 12th from 4:30-6:00 pm for the release party of But I Am Myself, And I Am Perfect For It // Pero yo soy yo misma, y soy perfecta por eso, After-School Tutoring & Writing's spring publication! Students will read their work aloud. Bring a dish to share for our potluck dinner! Special thanks to the translators listed below whose multilingual brilliance helped showcase our students' work in both English and Spanish! Acompañanos a festejar el lanzamiento de el librito de la tutoría, But I Am Myself, And I Am Perfect For It // Pero soy yo misma, y soy perfecto por eso, el jueves, 12 de abril de 4:30-6:00 pm. Los estudiantes leerán su trabajo en voz alta. ¡Traigan un plato para compartir para la cena!